From Marvel’s Avengers Assemble, Thor will come packaged with the Squadron Supreme’s Nighthawk. This is the first Minimate of Nighthawk ever made! Thor will include an alternate hair piece and his hammer Mjolnir, and Nighthawk will feature a removable mask. Also from Marvel’s Avengers Assemble, Iron Man faces off with the Squadron’s Power Princess. This is the first poseable figure of Power Princess ever made in any toy line! Both characters’ helmets are removable, and Power Princess will include her hammer and an alternate hair piece. 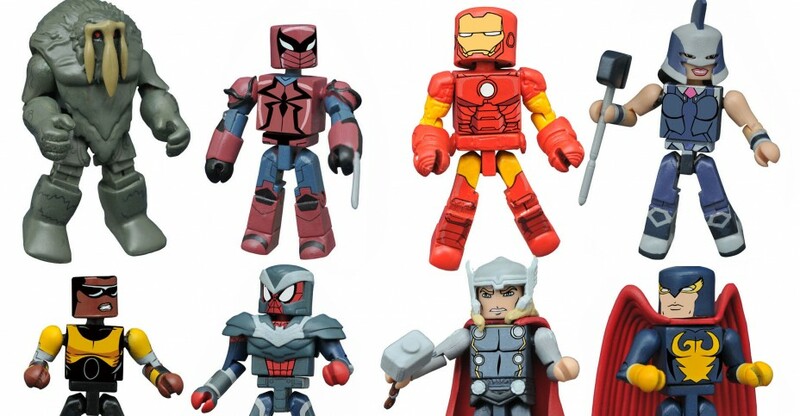 From Marvel’s Ultimate Spider-Man, SHIELD Armor Spider-Man comes with his teammate Power Man! Spider-Man comes with a blaster, and Power Man includes an alternate head with a new facial expression. Also from Marvel’s Ultimate Spider-Man, the medieval hero Spyder-Knight teams up with Man-Thing, one of SHIELD’s Howling Commandos. These are the first Spyder-Knight and Man-Thing Minimates ever made! There are new photos, with packaging and loose figure shots, after the jump.